I planted these rosemary and strawberry plants a few weeks ago, in winter no less. And they haven't died yet. It's really comfortable and, at 2.2 metres, it's plenty long enough for me to stretch out on. Now I just need to work out what to hang on the wall over the couch. All I know is that it needs to be BIG. I did have one thing ready for my new couch though - I made a pillow! Weekend before last, in consultation with Mum, I sewed this up, complete with three buttons on the back. 10 down, 20 to go. 4. Visit wineries in the Yarra Valley. First we stopped in Yarra Glen for coffee and to plot our Shortest Lunch route. Timed to coincide with the winter solstice, held on the shortest weekend of the year, Shortest Lunch is an annual event where smaller winemakers in the Yarra Valley offer small meals and wine tastings. The idea is you visit a few wineries and partake in a progressive lunch. This event is one of my favourites - it's at least my fourth time attending. Our first stop was Graeme Miller Wines where we began drinking wine tasting at 11:10am. The chicken, vegetable and chickpea soup was quite nice but they were also offering pumpkin ravioli. Pumpkin, blerk. It was an Aussie beef burger with caramelized onion and homemade chutney at Yilenna Park, where I had a really interesting chat with one of the winemakers. Their vines were saved during the Black Saturday fires by an underground watering system, although the crop was ruined by smoke. It's amazing the number of factors that can effect the taste of wine. But no way was I sharing my hot apple pie at Yering Farm Winery. This was the one winery I've been to every year - skipping it wasn't even discussed. We weren't missing that apple pie! This afternoon I carved out a space on my messy desk and created a few cards and wrapped a few presents. As this present is more than a little late, I thought it was the least I could do to make the card highly personalised. :) The letters were cut with my Silhouette and backed with paper while the banners were placed above the white layer. As we don't know yet if Chip is a boy or girl, I tried to keep the card gender neutral with teal, orange, yellow and green. It was my first time using Studio Calico's Mister Huey Shine and, although my application skills could do with work, I love that stuff. To decorate the presents that go with both these cards, I created some paper garlands. I cut some circle shapes from the same paper I used on the cards, then ran them through the sewing machine, leaving some extra thread between each shape. Then I just wrapped the garland around the present a few times and attached it at the back. I'm really pleased with how these turned out, although the paper on this last one is a little mushy. Darn awkwardly-shaped present! On Sunday night I had some friends over for dinner. Between shopping, cooking - lamb shanks with polenta - and cleaning, it was a pretty busy day. My guy arrived a few minutes before the others. As we were sitting on the couch waiting, he commented that he bet I'd taken a photo of everything looking nice. I felt a little irked. I'm not convinced it's a good thing that he knows me so well! On Saturday morning I settled in and did some scrapping. On the agenda - working on my A Year of Weekends mini album. The first weekend in my album used a big chunk of patterned paper, something which I hadn't really done again. I'm glad I was able to incorporate some here and tie it all back in. Not a big thing but it makes me happy. Never thought to include memoribilia when I started this mini. Now I love using those bits and pieces. This is definitely one of my favourite weeks. Something about the square letter stickers and date stamp on the photo = love. Not enough time for all that I want to do, let alone all that I have to do. Hmmm…I think I wrote that the wrong way around. Although, it might just be a more accurate representation of my priorities. 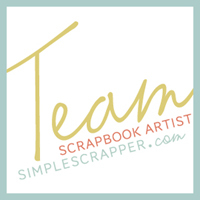 :) Forget cleaning, cooking, washing, grocery shopping - I don’t have time to work on all my scrapping projects! I don’t like using the term ‘behind’ when talking about scrapping. I scrapbook because I enjoy it and absolutely believe every story told is an achievement. So, lets just say that the weekends we have experienced this year are increasing at a greater rate than those recorded in this mini. ;) The problem is, I’ve been too busy enjoying those weekends! And that’s not a bad problem to have. :) When I have a couple of hours to devote to this project, it wont take me long to complete a bunch of pages. I am completed up to Thursday on this project, although for some reason I started with Sunday and am working backwards. So, I’m not quite halfway done. I decided to create the basic structure first, simply putting photos on pages, and intend to add details and words when that is complete. In the long run it will create a bit more work for me (particularly as I keep importing the pages into Blurb to see how they look!) but I’m finding it helpful making obvious progress and not getting bogged down on finishing touches. Aside from already starting to think about this year’s Learn Something New class – run in September; my mind is planning ridiculously early! – I’ve had the idea of starting a mini book documenting some of my favourite things about winter. Obviously I didn’t have enough on my scrappy to do list! ;) I see it being a perpetual project that I can add pages to, as the mood strikes, for years to come. I think it will be a reminder to focus on the best parts of winter, rather than the cold and rain and just wishing the season away. I love using scrapbooking to alter my attitude like this! So why today’s focus on time? Well, my guy works shift with a 4 days on, 4 days off roster. Recently he was asked to swap shifts and we were lucky enough to get two runs of weekends off back to back. It's been great – we've had weekends away camping, to Echuca and to Rutherglen and did a heap of painting – but now I’m so ready for him to be back to work! I need some time alone in my studio! You just wait though, a week or so of scattered evenings together and I’ll be missing him. Oih! A long weekend away. 6 friends. 7 wineries. A sunny winter's day. Just perfect. Mike, Ben, Dani, Pat and I drove up to Yarrawonga Saturday morning, arriving in time to meet Sean and Di at the pub for lunch. It was a cruisy afternoon, watching episodes of Revenge. We got through the whole first series over the weekend! Sunday was all about wine. Our first tasting was at 10am. ;) Winery Walkabout is an annual festival held by wineries of the Rutherglen region. There are wine tastings, markets, food, bands and other entertainment. The best thing - the shuttle buses that travel between wineries. It was my first year attending and I loved it. Definitely want to go again!